Alastair got involved in typical GUAC Student activities such as the traditional week/weekend at the Isle of Man. On one occasion a team of Douglas MacDonald, Alastair, Ian Archibald and Raph Murray (Freya’s uncle) won the relay at the Manx Easter Festival as well as being third in the Friday night team race and for their efforts picked up the awards for the best overall team and the best student team They are pictured below on the left – click on the image for a bigger picture. The picture on the right is of the Scottish Universities 8-in-a-row cross-country winning team: Tom Logue, Ian Archibald, Alastair, Doug McDonald and Gordon Colvin at the back with Raph Murray and Steve Brennan in front. He himself rates the Glasgow University victory in the British Universities cross-country championships as one of the highlights of his career: the English favourites were stunned because Glasgow University had not entered into their calculations! Initially Alastair was coached by Albert Smith at Victoria Park and in the mid-80’s he had a short spell with Alex Naylor but by and large he looked after his own training. He trained with a good group at Victoria Park and one of his club-mates reckon that this was the best track running he ever did. Even then it was clear that he had a desire to succeed and it was when training with Albie that he went to Professor Peter Radford (an Olympic medallist and a man who had shared the world 100m record for a time) and asked if he could help him to improve his sprinting. He was advised to do skipping and to do specific drills. He used to do them behind the stand at Westerlands and when the other runners saw him at it they apparently cracked up! His career really started to take off in 1977 when he won the Scottish Schools Cross Country Championships and was third in the Senior Boys race in the National Cross Country Championships, picking up a team medal with the victorious Victoria Park Team. That was his final year in the age group and the following year as a first year Youth (Under 17) he was second to Graham Williamson in the National Cross-Country Championship leading his club to the third team award. On the strength of this run he was selected for the Junior International Championships in Dusseldorf where he finished fifty ninth. In summer 1977 as a Youth, He was first in the Scottish Schools 3000m in 8:55.0, second in the SAAA 3000m (8:43.5) and SAAA 1500 (4:02.3) and third in the West District 1500m . Further afield he was eighth in the Final of the AAA’s 1500mm with a time of 4:00.8 and fifth in the British Schools 3000m in 8:46. Alistair ran well enough in the National in 1979 to be selected for the international to be held in Limerick where he was eleventh finisher, one place behind Ian Campbell of Dundee. His track form was also excellent when he ran into third place at the AAA’s 5000m championship. He was still a Junior on the track in summer 1959 and was second to Colin Hume with a 3:56.3 against Hume’s 3:55.7 His best for the season however was 3:51.0 for fourth at Grangemouth on 15th June . This made him second on the list behind Graham Williamson who had a really amazing time of 3:36.6. First in the Junior 3000m (8:17.8) ahead of Peter Fox and Adrian Callan and 500 where his time was 14:36.2 – well clear of the second runner. In season 1979-80 Alastair was asked to run the very difficult second stage of the Edinburgh – Glasgow race where he faced some of the very best road runners in the country but he was equal to the task, taking over in third place and maintaining this position with the fourth fastest time of the day. In the National in 1980 he was twelfth in the junior race which was a bit far back for selection to the team. This was down to injury (Achilles tendon) and he probably only ran in it because it was the National Championship. . In the Edinburgh to Glasgow in 1981 he ran on the fourth stage where he moved from sixth to third with the second fastest time of the day in a team that finished fourth. The National in 1982 was one of his best races in the event: in his first race as a senior man he finished fifth ahead some of the strongest runners in the country. For a first year senior to come in ahead of that seven is quite remarkable. He was, of course, selected for the International and travelled to Rome for his fifth outing in a Scottish vest where he finished 135th – again it was a scoring position for the team. The following summer (1982) his best time for 5000m was 14:46.0. At the end of the year he ran in the E-G, back on the second stage where he dropped one place (6th to 7th) but that was to George Braidwood of Bellahouston Harriers who ran really well to pick up from eleventh to sixth. The National was not such a happy hunting ground in 1983 when he could only finish forty first. In November he missed the Edinburgh to Glasgow either for Victoria Park or for the University team. 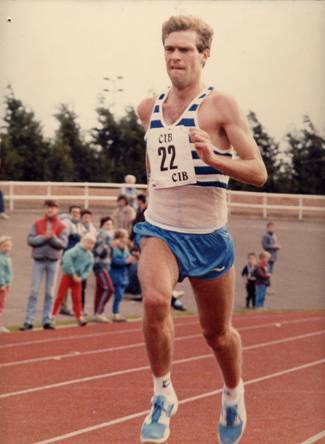 The 1983-84 cross-country season gave him one of his happiest memories when he was part of the Glasgow University team that won the British Universities team championships and he ran better than the previous year in the National when he was twenty fifth. In the E-G in November that year he was again on the second stage and pulled in one place when he moved from 8th to seventh with the sixth time on that stage. In the course of that winter he won the tough inter-area match on the heavy Stirling course and also had a very good run in the Belfast International where he was twelfth in 22:51 and with Nat Muir second (22:10 and Neil Tennant ninth (22:39, the team was second to England. That summer (1984) there was a 14:24.1 for 5000m. At the cross-country championships in 1985 he moved closer again to his true form when he was tenth across the line. From the 1982 National Cross-Country: Look for Nat, Allister, Lawrie, Fraser, John Robson and Alastair for a start! 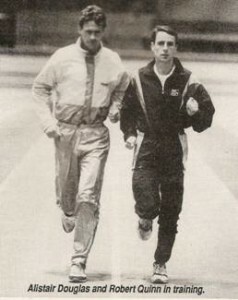 In the summer of 1985 he set not one but two pb’s for the 5000m: 14:11 for second in the British Students at Crystal Palace beating Robert Quinn into third place and then 14:07.78 for fourth in the National behind Braidwood, Quinn and Gilmour. Alastair then contracted glandular fever and and struggled for four months. 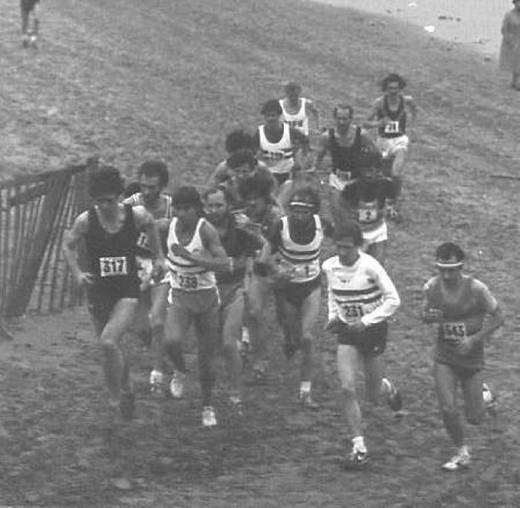 1985-86 season he ran the Edinburgh to Glasgow, this time on the long seven miles of the sixth stage where he picked up from thirteenth to twelfth. On the 18th of May 1986 he ran in the well-supported and high quality Luddon Half Marathon at Kirkintilloch and finished third in 67:01 behind Peter Fleming (65:56) and Graham Crawford (66:36) and then bettered that with a 65:37. Later in 1986, on 24th August, he went to Irvine for the Marymass 10 Mile Sand Run and won in a new record time of 53:23 – a full one and a half minutes ahead on the second man. On the track he ran 30:31.8 for 1000m. He started the winter with a good run in the George Cummings Road Relay at Kilbarchan where he had third fastest time (11:24) behind Tommy Murray (11:21 and Doug Frame (11:22). In March ’87 he went to the fearsome Edinburgh University King’s Buildings 10 Mile Road Race which he won and at the end of the month he won again – this time in the St Mungo’s Charity 10K Road Race in Glasgow where his winning time was 28:26 which was another victory by over a minute. On the track he ran in the Glasgow University Sports Day in May where he won the 3000m in 8:47.0 as preparation for the BUAC Championships. They were in June 1987 and were held at Meadowbank and Alastair was out in the 10000 metres where he won another medal for finishing second in 30:18.86 By the end of the summer he was ranked eighth in Scotland for the 10000m track with a season’s best of 30:18.86. Heading into winter 1987 – 88 Alastair had four races in August: On 2nd August he ran the fastest South Lap in the Corrie Capers Relay in Arran, on 13th he won the Round Cumbrae 10 Miles in Millport in 57:04 from Chris Robison who was well back in 52:42. On the 19th it was the Irvine Marymass Festival again where he ran in a 10K Road Race this time and finished third in 31:06 behind Alex Gilmour (Cambuslang) and Steven Conaghan (Glenpark). The month was finished competitively with first place in the Inverclyde Quarter Marathon in 32:05 in another close finish – only two seconds in front of Lawrie Spence. Came 26th September and he was fastest of the day in the Kilbarchan Relay with a time of 11:12, three seconds faster than John Graham running for Motherwell. On the 25th October, he won the popular and well-supported Grangemouth half marathon in 65:45 from track and cross country internationalist Chris Robison who was over a minute seconds behind. In the Glasgow University 5 Mile Road Race only the race recorders cost him another win when he was second to Adrian Callan but in exactly the same time of 22:26. Given that Victoria Park did not have a team in the Edinburgh to Glasgow in November 1987. In November ’87 he was fourth in a race at Gateshead with Steve Cram one of the runners in front. Alastair went to East Kilbride on 8th December 1987 for the 10K Road Race where that man Callan again won (29:23) with John Robson second (29:27) and Alastair in third place with 29:40. The reward for all this fine running was a trip to a New Year’s 10K in Balzano, Italy. Adrian Callan was twelfth (29:30), Alastair fifteenth (29:45) and Eddie Stewart twenty fifth and they won the team prize. He won the Dunbartonshire County cross-country championships at Postie’s Park in Dumbarton leading VPAAC to a team victory and just for a change ran in an indoors 3000m for a Scottish Select v Midland Counties where he was third in 8:20. He also that winter set an indoor pb of 8:07 behind John Robson. He was 46th in National Cross-Country Championship in 1988. A look at Alastair on the track. Cowal, 1981 – look at that crowd! Alastair’s personal bests’s for track running are listed below. Mainly known as a cross country runner Alistair showed enough talent in his forays on to the track to indicate that had he decided to spend more time there, he could have been a considerably good track man at a time when Scotland was already blessed with quality athletes in his chosen events. For instance, in the year in which he won the 10000m championship referred to above, he was working 100 hours a week as a junior doctor and in fact he had to turn down at least one invitation to represent his country at 3000m on the track because of the working hours required of him. His achievements on the track were at their best when he was a young athlete – even at school at Glasgow Academy he set a 1500m record of 4:01 which still stands. As a student his track running had been every bit as good as his cross-country exploits: we have mentioned some already but to summarise: 3 Scottish Universities Cross-Country Championship victories, 2 x 500, track championships and 1 x 1500m; at British student championships there’s a fifth (1982), a fourth (1987) and a team winner’s gold in 1984 on the country and on the track he had second in the 5000m in 1981, 1984 and 1985, a third in the same event in 1982 and a second in the 10000m in 1987. For reasons many and varied he never ran much on the track as a senior athlete, which can only bring to mind the old Scots query “What if ………. ?” Certainly a friend and athletics team-mate of Alastair’s says : “My view was that he underperformed on the track, despite winning the SAAA 1000m. His best track years were when he trained with Alby Smith who focused more on middle distance. 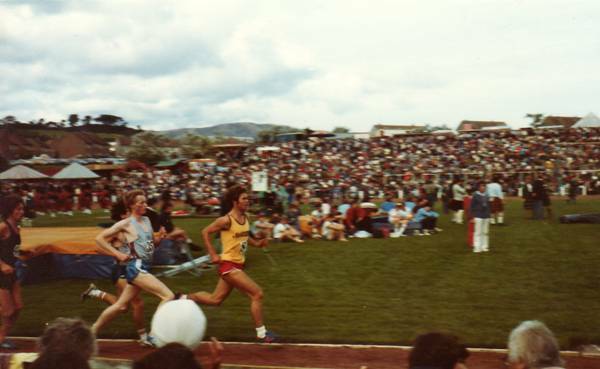 I can’t remember his best 1500m time but this was the only track event where he has a pb that probably reflected the best that he could do.” He certainly made the final of the SAAA 1500m in 1980. He started the1988-89 season with fastest time in the Dunbartonshire Relays leading his club to second place. On 17th December he ran in the Irvine Harriers Runners v Cyclists race and won from Bobby Quinn with no time given. On 23rd April he turned out again in the St Mungo’s Hospice 10K race where he was fourth this time in 33:28 and just three days later he was eleventh in the Adidas Torsion 5K where he was back in eleventh in 14:55. On 3rd May he ran in the Adidas Torsion 8K Road Race in Glasgow which was won by his friend Robert Quinn in 22:51 with Alastair tenth in 24:30. Three days later on 6th May Bobby won the Campsie 10K at Lennoxtown in 29:54 with Alistair seventh in 32:06. Four days on and Tommy Murray won a (short course) 10K in 29:48.2 with Alastair ninth in 30:07. He appeared on the rankings for 1989 at 10000 metres with a best of 30:00.6. In the second half of the summer (August 1989) he raced at Grangemouth in the Inter-District 5000m for the West of Scotland and finished fifth in 14:49. He had many close finishes in his career and more often than not he won them – this time the sixth placed runner as Martin Ferguson from Edinburgh who was also given 14:49. On 16th July he went back to the scene of his previous success in Inverness for the People’s 10k where this time he finished sixth in 30:52, with the race being won by Peter Fleming in 29:39. On 17th September when the Great Scottish Run was held over the unusual distance of 25K he was fifth finisher in 80:45 and second Scot behind Tommy Murray (80:27). The traditional start to the winter season was the McAndrew Relay race at Scotstoun, promoted by his own club. This time, 1989 – 90, Alastair had the fastest time of the day – a not inconsiderable feat – with 15:03. On 28th October in the National Relays he was second fastest in 12:21 with Peter McColgan fastest (12:07) He then had a very good run moving from 21st to 16th on second stage of the E-G. The Allan Scally Relays on the first Saturday in November were another good day for Alastair when he was fourth fastest in 22:18: the first three were Nat Muir in 22:02, John Robson in 22:09 and Allister Hutton in 22:15. On 19th November he returned to Bellahouston Park where he was third behind Tommy Murray and Eddie Stewart (Cambuslang Harriers) and one week later he won the County Championships in 28:32 in front of Glen Stewart (28:47). Saving the best to the end of November he ran in the Presto Open Cross Country Races at Gateshead on the 25th and finished seventh in 20:42 which made him first Scot ahead of John Robson (9th in 20:50 and Bobby Quinn (10th in 20:25). Right at the start of 1990 he won another classic – the Nigel Barge Road Race at Maryhill over the tried and tested course from Cleveden Street and he won in 21:48 – another close finish and a victory by only one second. It was a real classic course and all the stars of the past including Ian Binnie, Emmet Farrell, Andy Brown, Jim Brown had run it and to be only one second outside the course record was another exceptional run. It is one of the races that Alastair himself rates highly. On the eleventh of February he ran in the Falkirk Round the Houses 10K at Grangemouth and emerged victorious with a time of 29:43 from Billy Coyle (Shettleston) in 29:51. On 24th February he ran into fifth place again for the second time, finishing one place and three seconds ahead of Steve Ovett, a magnificent run. The following day, 25th February, he ran for the SAAA District select against Scottish Universities, Scottish Schools, Loughborough and Birmingham in the 3000m and finished third in 8:31. Unfortunately after this good winter and excellent run in the National, his appearances became fewer and more intermittent. Maybe it was injury, maybe it was work-related, but the truth is that he was not seen in action very often over the next few years. On 1st September 1990 he was second to Robert Quinn in the Calderglen 10 Miles with a time of 50:43 behind the winning time of 49:50. In 1991 he ran exceptionally well for several weeks in the summer: on 8th June he was second to Nat Muir in the Monklands Festival 10K in Coatbridge with only two seconds separating the runners – 33:03 to 33:05; he faced Nat four days later when on 12th June he was again second, again by two seconds in 30:52 (Nat 30:50); and on 16th June in the Inverclyde 10K at Greenock he was again second to Nat Muir in 30:23 to Nat’s 30:23. There’s consistency! On 1st July in 1991 he won the Isle of Mull Half Marathon in 70:34 which was a course record and two weeks later (15th July) he was second to Bobby Quinn in the Saltcoats 4 mile race with Quinn setting a record 19:33 for the course and Alistair being only one second behind him. Two weeks later on the Isle of Arran, in the Corrie Capers Relay he set the fastest time of the day on the first stage of the relay. Training was going well and so was racing. Then there was a big gap. The next race that I could find was the Nigel Barge race on 5th January 1992 when he was thirtieth and then on 29th February 1992 when he finished eleventh in the Balloch to Clydebank in a very creditable 67:15. If we look at his Edinburgh to Glasgow appearances over the next ten years we see that although by-and-large he did not run at the same consistently high level, he did well enough: In 1990 he ran on the eight stage; 1991 he ran a first-class second stage to bring his club from sixth to first with the third fastest time of the day; in 1992 he did not run; 1993 he ran on the 6th stage; in 1995 he ran on the second stage; in 1996 he again ran on the second stage; in 1999 he was on the eighth stage: in 2000 he was on the first stage; 2002 he was on first stage in the last E-G. He therefore ran in the race for his club from 1978 – 2002: he ran in a total 19 E-G’s (could have been more), and ran on five different stages 1,2,4,6,8. The figure could have been higher because on several occasions when he would certainly have been an important runner for them, the club did not have a team in the race. The eight-man Edinburgh – Glasgow was one where the club man came into his own and even when the club was not going well and Alastair was, he turned out and there were also times when he was not running/racing well but competed for his club. Indeed for all but one of his years at University he turned out for Victoria Park and after a single year racing in University colours on open races, he was good enough to get his University ‘blue’.